I just love this rug. It’s so soft and adds elegance to any bathroom. I would definitely recommend it to my friends. The color is amazing! Put the finishing touches on your bathroom's look and feel with the soft, super-absorbent cotton and tranquil tones of these bath rugs. The versatile rock design, lets you customize your setting to suit your stylish appointments. This is a nice quality rug. It suits my needs perfectly. I gave it 5 stars because of the thickness and the nice woven feel but the ruffles do take a while to settle down so don't get discouraged by that. After a couple of weeks it looked great!! 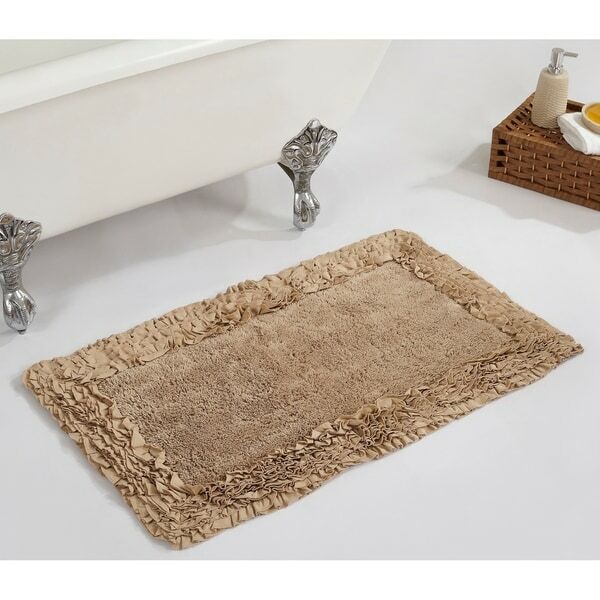 I love the rugs, they are just what I wanted for my bathroom. The lighting in my bathroom has them take on a brown tone even though they are grey. However they blend with the floor and look good. Very disappointed with the rug, the ruffle quality seemed cheap to me and i was worried it would not wash well. I did not end up keeping the rug as it downgraded the look of my bathroom. Terrible product cheap clean them one time and they are unraveling ordered rugs in February 22 today is April 18 so I am past the 30 days and they are not standing by their product. Rug is cute but not as plush as I would have preferred, but great for the price. Not worth the money. Too thin and moves about too much.